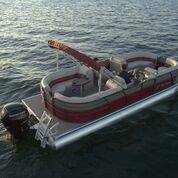 The Biscayne Bay is the perfect boat to enjoy the lake with family. 60 HP SUZUKI $29,999! 115 HP SUZUKI 32,999! 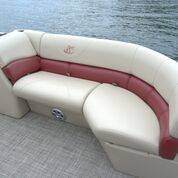 The Biscayne Bay CU has four chaise lounges to allow every passenger the perfect spot to enjoy time on the water. 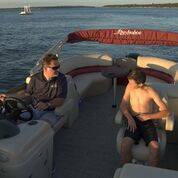 The standard Deluxe Captain’s chair both swivels and slides, and when paired with its matching co-captain’s chair across the deck, conversations are easily enjoyed. A tilt steering wheel can be easily adjusted to every captain’s preference. 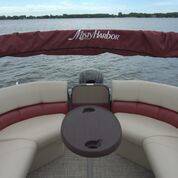 A Kicker Round Bluetooth stereo system with four speakers brings your favorite tunes to life aboard Misty Harbor. 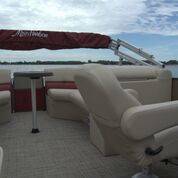 Biscayne Bay’s standard neutral furniture package provides a rich look and feel to your pontoon, and stainless steel cup holders allow plenty of storage for your favorite flavor in your cup or can. Courtesy lights illuminate the floor for night time cruises. On the exterior, you can choose either monotone or two-tone color fencing at no additional charge. 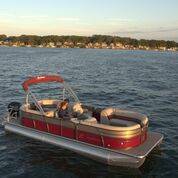 LED navigation and docking lights pierce through darkness to deliver you into safe harbor.